In a large bowl, combine the first six ingredients. Combine the salad dressing and salsa in a separate bowl. 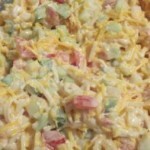 When ready to serve, pour the salad dressing mixture over the cheese and vegetable mixture and stir gently to combine.